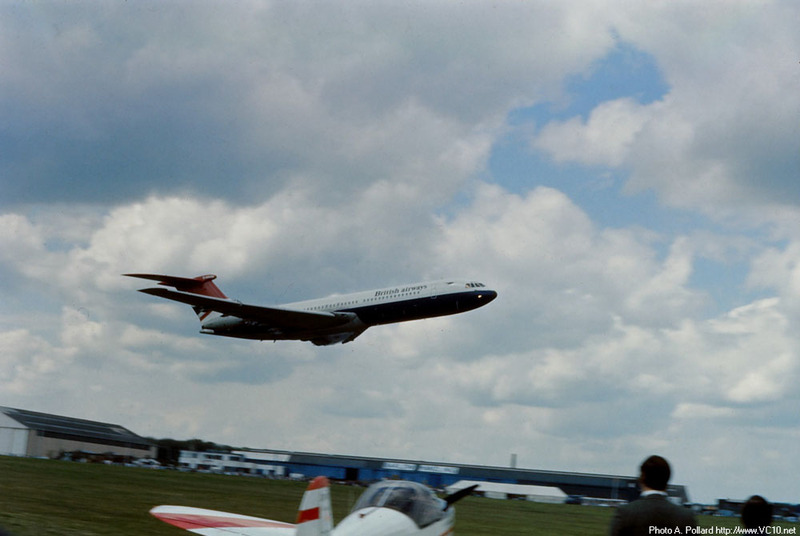 The Silver Jubilee of HRH Queen Elizabeth II was celebrated in many ways, including a 'display of historic aircraft' during the weekend of 14 and 15th May 1977 at White Waltham. It was at this airfield that Prince Philip was taught to fly in 1952. The line-up during this May weekend did indeed feature a variety of historic aircraft from both the first and second World War. One visitor that stood out in several ways was Vickers VC10 G-ARVM, both the largest and the newest type to attend the airshow and one that managed to thrill the crowd with its spectacular flypast. On the 14th May the aircraft performed a low flypast with its gear up, on the next day this was repeated but this time with gear down. Having seen footage of both flypasts, it is the one from the 14th (see footage below) that everyone remembers, and for a reason. This year marks the fortieth anniversary of 'VM performing this flypast and I thought I would commemorate this by gathering all the different memories from this weekend on one page. 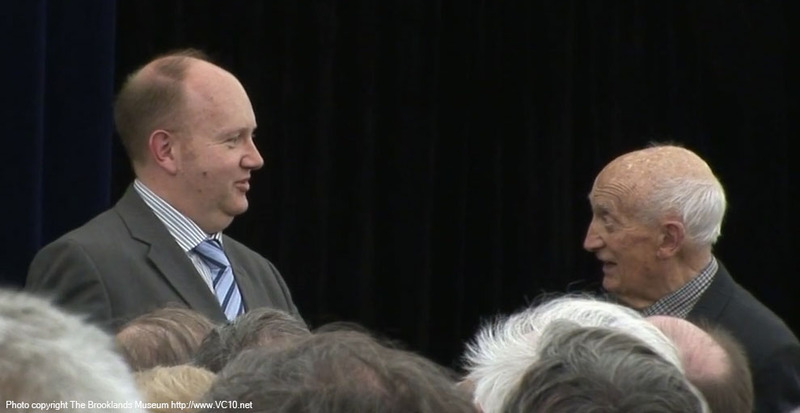 Max Kingsley-Jones (L) talking to Captain Tony Smith (R). Max Kingsley-Jones: "We all thought that it looked like you could have put your wheels down and touched down at one point." Tony Smith: "Well, I was close to the ground..."
Judge for yourself from the stories, photos and footage below. 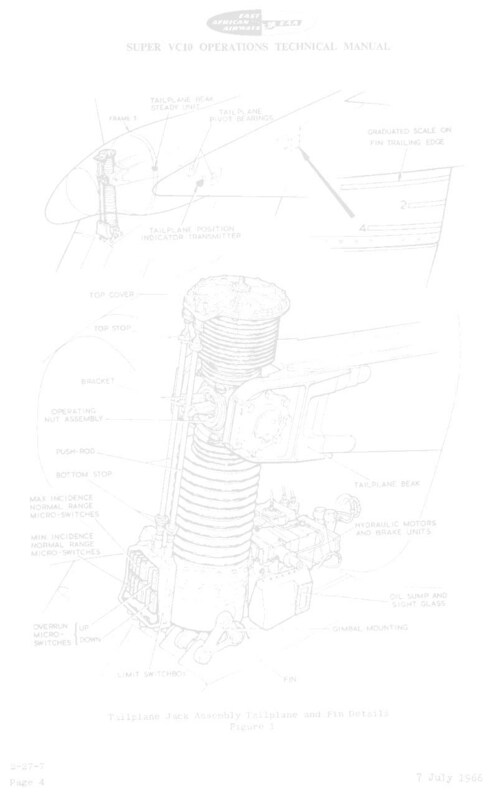 "This is a copy of a photo by John Clements that hangs on the wall of the bar at White Waltham airfield in Berkshire. It shows BA VC10 G-ARVM making a low pass at the 1977 Silver Jubilee air show on 14-15 May that year. Capt AJ Smith, F/O A Harkness and E/O T Snell were at the controls. Rumour has it that the aircraft went even lower than the picture shows as she flew down the runway. Does any one remember this event?" G-ARVM making an interesting low pass at White Waltham, must have been an impressive sight! 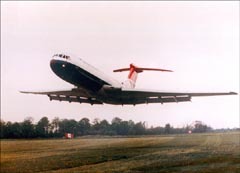 The photo below is one that was already on my site, showing the same low pass. Terry Selman spent many happy years working on the VC10 firstly as a BA engineer performing Major and Minor inspections in what was the Wing Hangar at Heathrow, and then as an Overseas Station Engineer. He sent me the following memory about White Waltham. To read more about his experiences click here. "I was at the time the duty engineer in Prestwick and in fact issued the Release to Service for the aircraft's return to London via White Waltham. It was normal practice to send Overseas Engineers to Prestwick between postings to cover crew training. The aircraft in your photo was almost always used for training as it only had a C of A in the Private category due to extensive corrosion. And of course having only a Private C of A, and no fare paying passengers, it could do almost anything and did at White Waltham!!!!!!!" 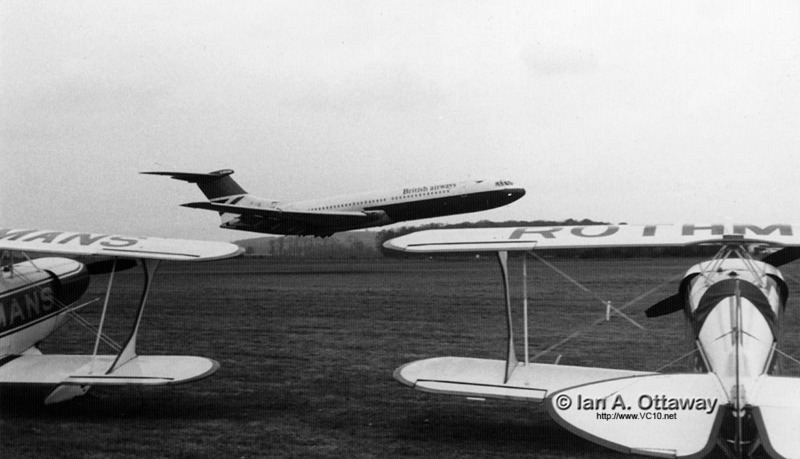 VC10 passenger service to White Waltham? While a trainee ATCO in 1977 John Baker managed to get a seat on the (by now famous) flight to participate in the White Waltham airshow. Here is his story (which was also posted on PPRuNe here). To illustrate it, I have added two photos taken by the late Anthony Pollard and one from Paul Turner. "I was a passenger on that flight! G-ARVM was the training aircraft based at Prestwick. In 1977 I was a trainee ATCO on approach and noticed a flight plan on 'VM to EGVY (White Waltham). So I rang Flight Clearance and told them about the incorrect destination! They informed me that the flight plan was correct and it was indeed going to White Waltham - but not for a landing!! So I asked if there were any spare seats - yep said the Captain, 'Get yourself to the apron'. So I was granted an 'Early Go' and got a lift to the apron in the ATC vehicle. A group of us boarded the aircraft and were ushered into an almost empty cabin. There was just a 'pod' of a few seats (10 or 15 I think), and told to make ourselves comfortable. We went Airways (Amber 1 - Ahh nostalgia), with a few dutch rolls on the way. We all visited the flight deck and chatted with the crew and the trainee pilots that were on board. 'VM left controlled airspace at WOD, and was too early for our slot to open the airshow at White Waltham. The Captain announced that he 'had a friend playing cricket nearby', so we went off low level 2,500ft looking for a cricket match! Apparently he found the village and the cricket team were treated to a flypast, anyone know where that was? We then continued to Twyford to follow the railway line to White Waltham. At that time the airfield was inside the London Control Zone, so we had to fly up the 'free-lane' and comply with the level restrictions. Was that (not above) 1,250ft? We did our flypast, just as Prince Charles was declaring the airshow open. In fact that evening it was on the national news with Prince Charles saying 'I declare this airshow - the rest being drowned out by the sound of a VC10 !!' After that we flew back up the free lane and rejoined controlled airspace at WOD, via the Ambers back to Prestwick. On the way back we discussed with the crew the flypast. I asked if the captain had meant to do a 'touch and go', he replied 'No, as the wheels were up!' It certainly looked close to the ground from inside! The return was quite leisurely with just a few more dutch rolls. I will always remember the galley curtains flying across from one side of the aisle to the other, almost horizontal. We then managed a few 'toasted sandwiches'. On return to Prestwick 'VM then went straight into the circuit. Unfortunately the 'toasties' and the 'dutch rolls' took their toll on my stomach, so the Captain agreed to do a 'full stop' and return to the apron to drop me, and those other passengers that didn't want to spend some hours 'circuit bashing'. So that is the full story of the Saturday flypast at White Waltham. Thank you G-ARVM, a most memorable flight." 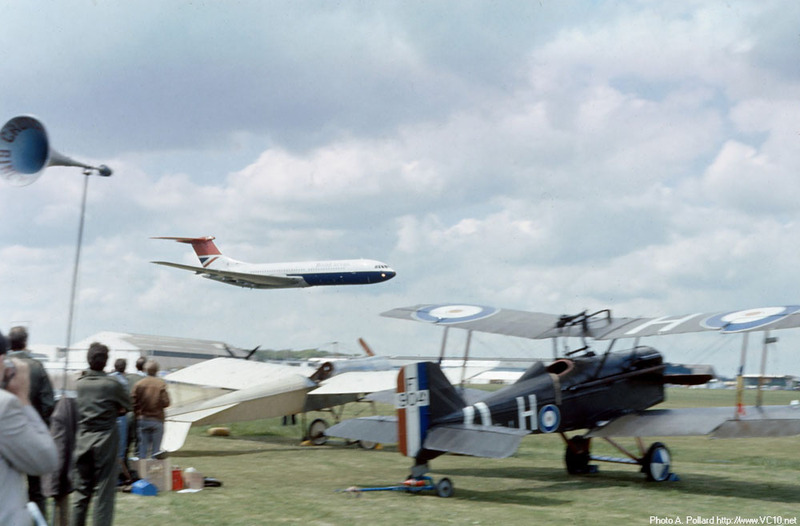 The airshow at White Waltham in 1977 is an event that still stirs up memories for many people and both Keith Jamieson and Michele Caso e-mailed me their impressions as spectators on that day. Then suddenly...we realised why...the VC10 broke cover over the airfield perimeter..................................................below tree level !?! At this point he was only above the ground by approx 10 feet or less......and with the Conways at 100%...proceeded with the 'Agricultural ploughing...........VC10 Style'. Clods of earth and grass being sent 100s of feet into the air accompanied by the awesome grunt of four Conways at full throttle................unforgettable. Someone out there must have a video.............."
"I was there! I am Italian but I have spent some years in Oxfordshire in the late Seventies. I went to the White Waltham Silver Jubilee Air Show, of which I have a very vivid memory. I was at the show since the morning and at lunch time, when flights had been interrupted, I spent some time among the commercial stalls browsing and buying. 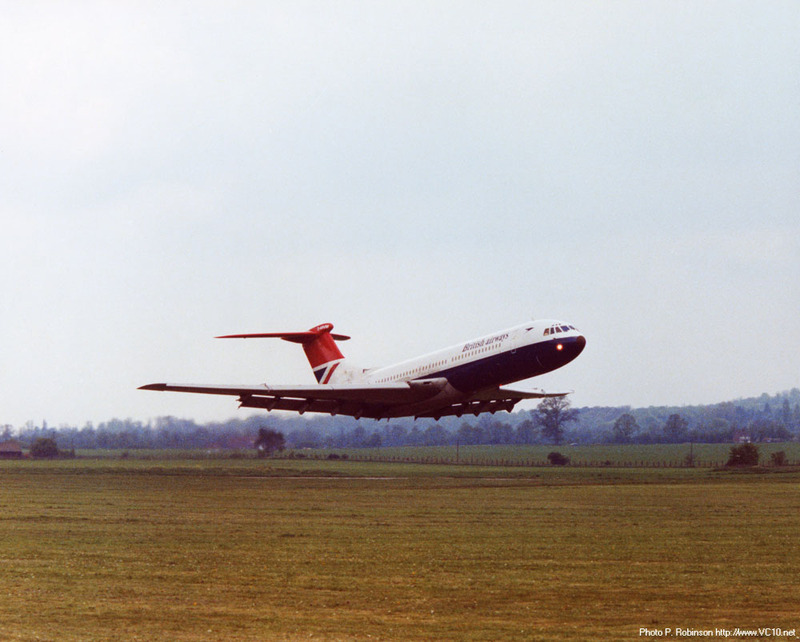 Suddenly I heard a very strong noise of an approaching aircraft and rushed towards the runway: when my sight was clear of the stalls I saw G-ARVM making its flypast. I remained astonished: seeing such a large plane flying so slowly, with a very high angle of attack and consequently the tail incredibly close to the ground: it is my strongest remembrance of air displays. And the rumors that it did fly even lower than the picture show confirm the impression I had: certainly the perspective had its effect but my impression was that the tail cone was at less than 3 meters above the grass. In any case, I am happy to have been there and to have seen this spectacular flight." 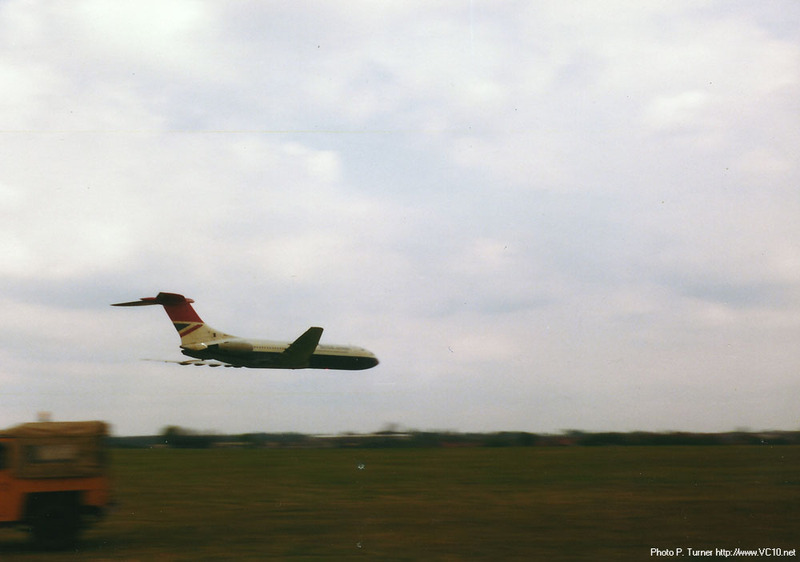 "I was there as a young sixteen year-old with my father (a VC10 engineer) and, being a huge fan of the VC10 anyway, I remember the display well. I remember commenting to my father that it was an unusual item to have in the display alongside the Lancaster, Mossie, Spitfire, Rothmans Pitts etc., but when it made its spectacular appearance it certainly stole the show. As noted, the Mosquito did a couple of very low level passes too. We were on the crowd line right by the Rothmans team and I remember being delighted to see Neil Williams, a hero of mine at the time. I took the attached photo with an old Agfa Silette camera, which was all I had at the time. The quality is therefore poor I’m afraid, even though I was pleased with the timing!" Ian's photo is indeed perfectly timed! The Silver Jubilee pageant at White Waltham in 1977 was recorded for posterity, but it took a while before this video turned up on Youtube. G-ARVM turns up around 2:44 minutes but the rest is also well worth watching.